A community discussion series to introduce the Colony1 sustainable living space to a wider audience while sparking a discussion on the role of citizenship and modern urban placemaking. 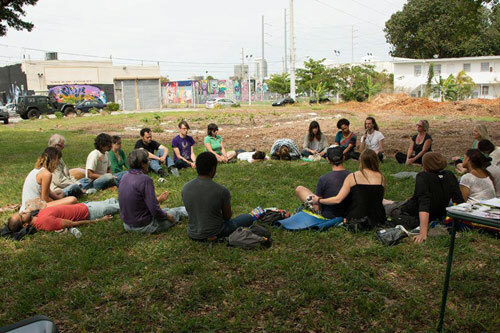 Set on the last green space in Wynwood, the Colony1 Sustainability Hub aims to become a model for ecological sustainability in Miami’s unique landscape, designed to educate the community through programming including workshops, art and science residency programs, and permaculture gardens. The first Conscious Collectives event took place in partnership with the People’s State of The Union. Participants shared their own raw and honest thoughts on the current state of the union, which were recorded, transcribed, and sent to the nonprofit U.S. Dept of Arts and Culture as part of a contribution to a larger collection of submissions from similar small gatherings around the country that day.